Qualcomm has responded to comments Apple CEO Tim Cook made in an interview, in which he said there had been no recent settlement talks between the iPhone maker and chip supplier in their global legal battle, calling Cook's remarks "misleading." The two companies are disputing comments their CEOs have made over settlement talks: Apple's chief has said that any talks ended in September 2018. In November, Qualcomm's CEO Steve Mollenkopf made comments about the supplier's efforts to resolve the dispute. Qualcomm on Tuesday said Cook miscast Mollenkopf's remarks, which did not mention a settlement and which Qualcomm maintains are accurate. The war of words is unlikely to play a major role in the outcome of the legal fight between the two firms. But it signals the high stakes and deeply entrenched positions of each side, with Apple arguing in court that Qualcomm charges an unfair "tax" on its phones while Qualcomm fights to protect a patent licensing model it argues has helped bring connectivity to billions of new users through wireless networks. "Look, the truth is, we haven't been in any settlement discussions with them since the third calendar quarter of last year. That is the truth. So I'm not sure where that thinking is coming from," Cook said. Cook's comments contrasted with those Mollenkopf made in November on CNBC. "We do talk as companies, and I think what you're seeing, really, are activities consistent, really, with the fourth quarter of the game, and not the first quarter," Mollenkopf told CNBC then. "We always talk about – and I've been very consistent - that this second half of  and into , is when we're really on the doorstep of finding a resolution." In a statement, a Qualcomm spokesperson said the company stand's by Mollenkopf's remarks. "We have been consistent for the last 18 months in making clear that we have, at various times, been in discussions with Apple about a possible resolution to our licensing dispute," a Qualcomm spokesperson said in a statement. “We have also stated clearly on several occasions that we believe it will be resolved, one way or the other, in the near future, either through a settlement or court decisions." The primary case in Apple and Qualcomm's legal battle goes to trial in April. 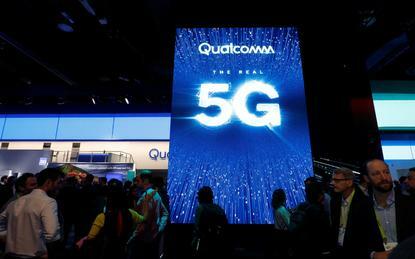 Apple has accused Qualcomm of engaging in illegal patent licensing practices to preserve a dominant market position in so-called modem chips, which help mobile phones connect to wireless data networks. Qualcomm has argued that its practices followed decades-long tech industry norms and that Apple has not fairly compensated it for its intellectual property.